Sunfresh Produce services all segments of the foodservice industry, including individual restaurants, school districts, hotels, retirement centers, country clubs and health care facilities. From our centrally located warehouse in Englewood, we service the area from Bradenton to Naples daily. 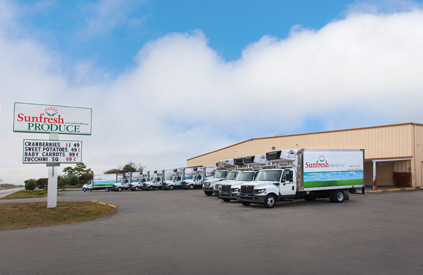 Our entire fleet consists of 2013 model year 18-24’ refrigerated trucks. These trucks are pre-cooled to maintain the cold cycle prior to orders being loaded. Each vehicle is equipped with GPS technology which allows constant monitoring and route optimization.